NBN Co releases test agreements for FTTB - jxeeno blog. NBN Co released, earlier today, the test agreement for Retail Service Providers for piloting their Fibre to the Basement trials in multi-dwelling units. The network builder had indicated late last year that they would trial this methodology of rollout in multi-dwelling buildings like apartments, office buildings and shopping centres, in an effort to speed up their rollout. In the trial, NBN Co will install a DSL Access Multiplexer (DSLAM) within the pilot buildings to exchange signals between the existing NBN Co fibre footprint and the copper pairs currently wired in the building. NBN Co will also install a combiner near the building's main distribution frame to combine the DSLAM signals with any existing telephone service currently delivered by Telstra's copper network. MDUs have previously been a problem for NBN Co, often taking several months to get connected after an area is declared Ready for Service. NBN Co had previously been mandated to complete a full fibre deployment in these buildings, however, a new interim statement of expectations from the shareholder ministers has enabled NBN Co to begin trailing this deployment. As part of the trial installation, NBN Co will be responsible for the installation of a VDSL splitter within the wall cavity of the pilot premises. 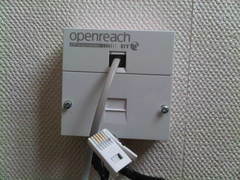 This splitter would separate the traditional POTS signals from DSL-signals such as VDSL and ADSL. NBN Co will also replace the first telephone socket on the premises with separate wall plate sockets for telephony and data. However, based on the test agreement, it appears the Retail Service Provider will be responsible for providing the DSL compatible modem. This clause implies that NBN Co intends to trial the mixed use of ADSL-based technologies to deliver lower speed tiers as well as VDSL2-based technologies to deliver higher speed tiers to the end user. Unfortunately, product technical specifications of the Fibre to the Basement deployment has not been made available to the public. As stated in the agreement, NBN Co intends to provide this information to Retail Service Providers prior to signing up to the pilot. It is uncertain if such documentation will be released to the public.